Climate change is recognized as one of the major environmental problems faced these days, and the effects of this scenario are really evident. As time passes by, climate change starts to pose dangers to living things that put health and life at risk. This problem has been linked to different causes, and it is also a warning and constant reminder for individuals to start caring for the environment and save the Earth. Climate change poses effects not just on human but also to all living creatures in this planet. This issue must be dealt with as soon as possible to avoid the worst effects on balance and sustainability. Individuals have their distinct roles to play, and it is about time to move and act. It is not right to blame everything on the environment itself for humans have their own shares of mistakes why climate change is now happening. Climate change has been a subject of many research and studies to deeply explore the causes and effects of this environmental problem. Scientists had been studying about this since the earliest years when the greenhouse effect was initially hypothesized. 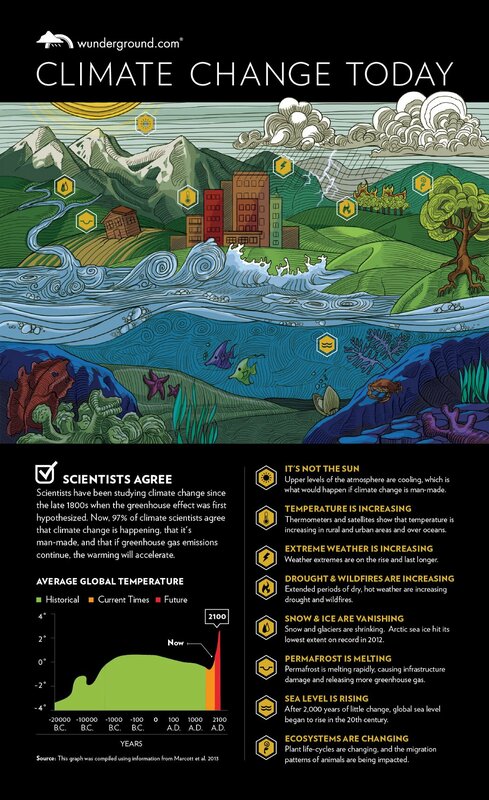 About 97% of scientists believe that global warming and climate change is now dominating the world. This is man-made, and if this situation continues, the warming will increase. The sun is not to blame for this threatening problem because individuals have their shares of mistake in destroying the environment. This might be unknown to them, but in reality, they have caused environmental destruction in their own ways. These things trigger climate change to reach it worst state. Extreme weather and temperature are increasing. Satellites and thermometers are showing that temperature is on the rise especially on urban and rural areas. Weather gets extreme and this accelerates and last longer as expected. Due to climate change, wildfires and droughts are also rapidly increasing, and periods of dry and hot weather are extended. Ice and snow start to vanish and glaciers dominantly shrink. Permafrost is rapidly melting, and this causes infrastructure damage and more greenhouse gas emissions. The rise in sea level is also an evident effect of climate change. Ecosystem is losing its balance and changing drastically. There have been changes in life cycles, migration pattern, and living condition of man, plants and animals. This problem is said to be man-made. Therefore humans and other living creatures have to suffer for the consequences. However, it might never be too late. The future potential effects of climate change can be addressed. There are possible solutions on how to do this and individuals have to take the effort o making the first move and everything will follow. Recommended solutions to put an end to this environmental problem are infrastructure upgrade, efficiency and ideal consumption, genuine environmental care and many more. It feels great to live in a safe and convenient world. This is the haven that embraces individuals and provides them better place to live that is why it is a must to protect it as much as individuals can.